Most of us have them and very few of us do anything to them! 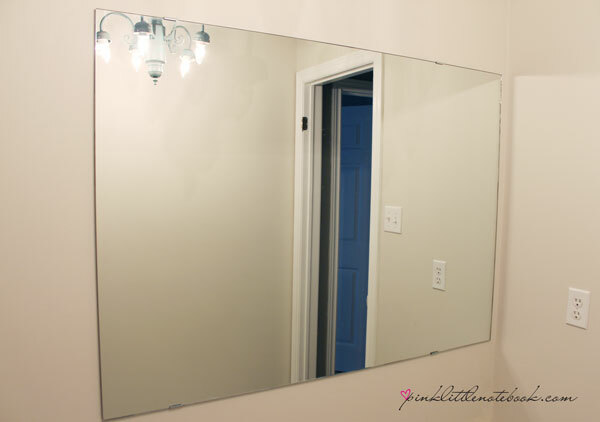 If you’re tired of looking at your old, boring, frame-less mirror consider sprucing it up yourself before purchasing a new one. One of the best parts about designing these frames are the endless styles you can create and not to mention, the budget friendly price tag attached to them. Depending on your skill level with power tools, this project can be as simple or complex as you want. I obviously opted for the easy way out! 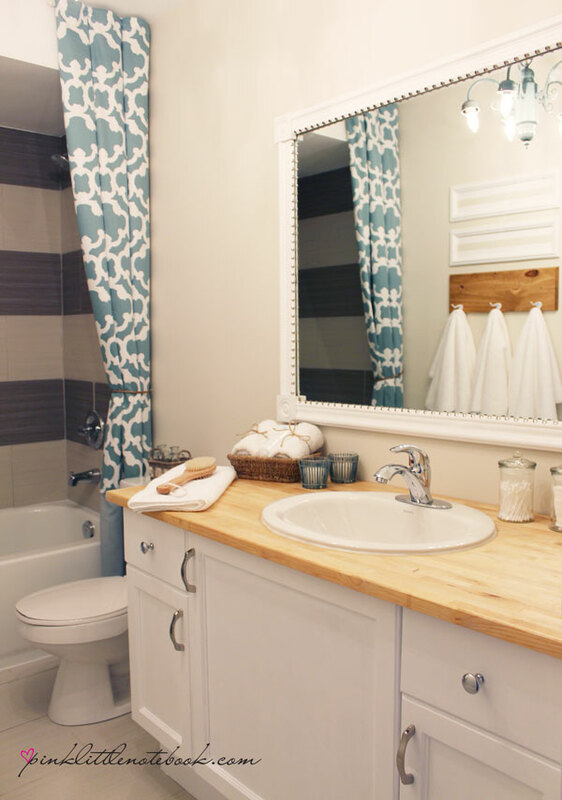 Remember the pre-makeover bathroom?! Well this is what I started with. 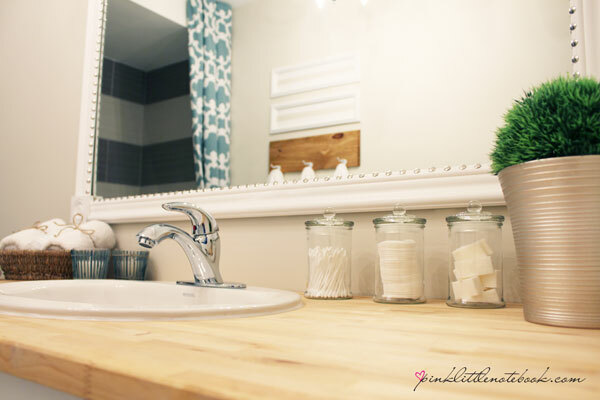 It has come a long way since then and my DIY frame sits in my newly, revamped, budget-friendly, love my bathroom, makeover (for more pics on my bathroom reno, check out my post over here). You ask, what’s the easy solution? – no miter saw cuts!…those 45 degree angle cuts can be tricky if you haven’t mastered it yet (unless you have this tool). First step: Measure your mirror. 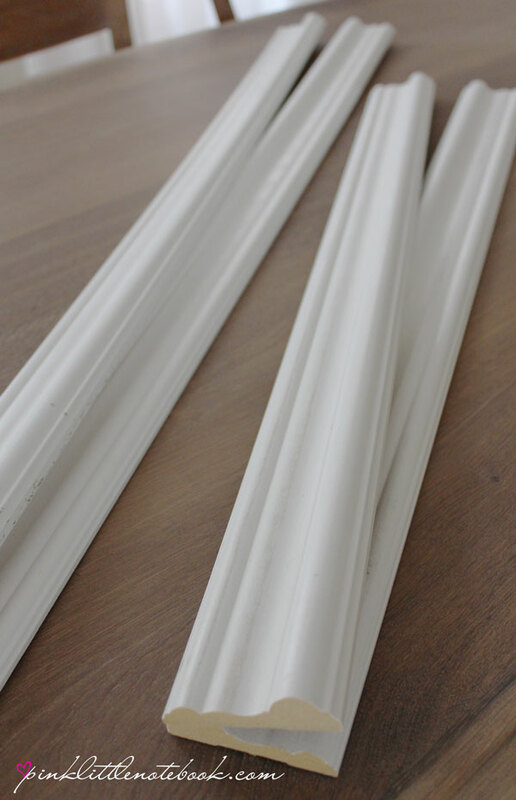 You need to figure out what size to cut your moldings. Don’t forget to take into consideration the four corners blocks will take up 3 inches of your total length in each corner. 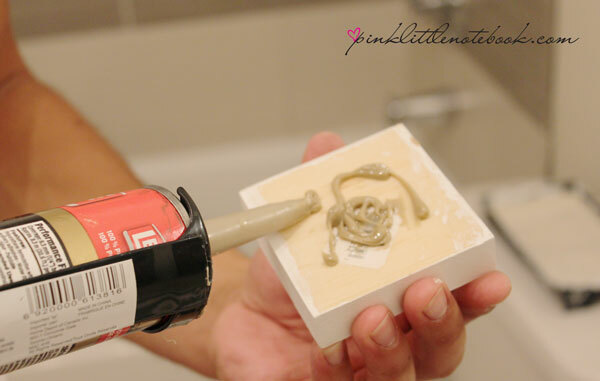 Step 2: Paint & decorate your molding as you like. 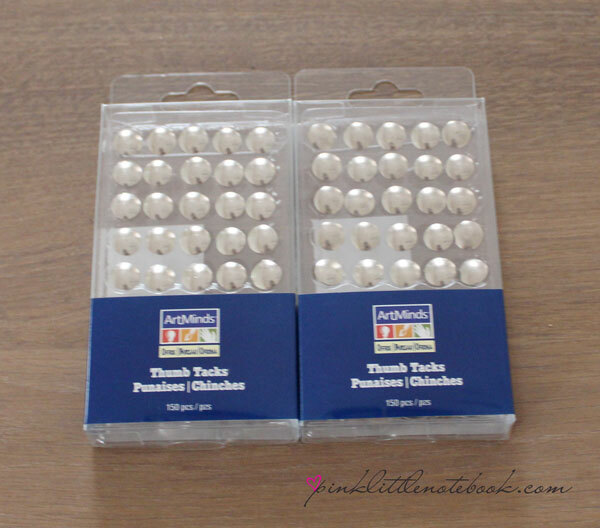 I painted our molding white and used thumbtacks to spruce it up. Upholstery nails would have worked better if you wanted to hammer them in but I really didn’t feel like stumping my thumb that day! 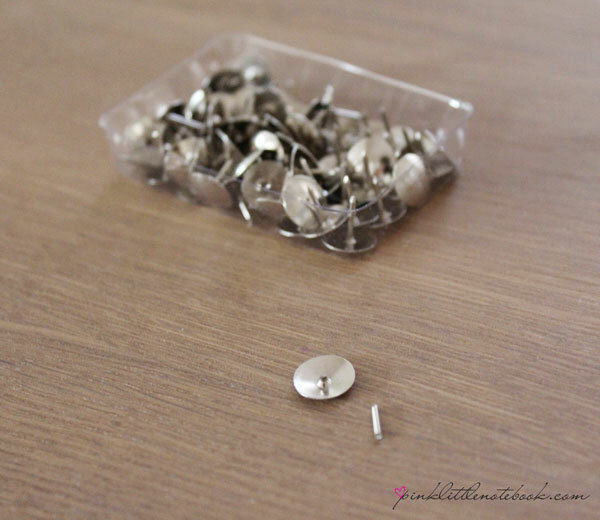 Being a little crazy, I snapped off the pins of the thumbtack and glued them on. For a more evenly spaced look, I used a ruler to help me set them 1 inch apart. Step 3: Put it all together! You may need a helping hand for this part. 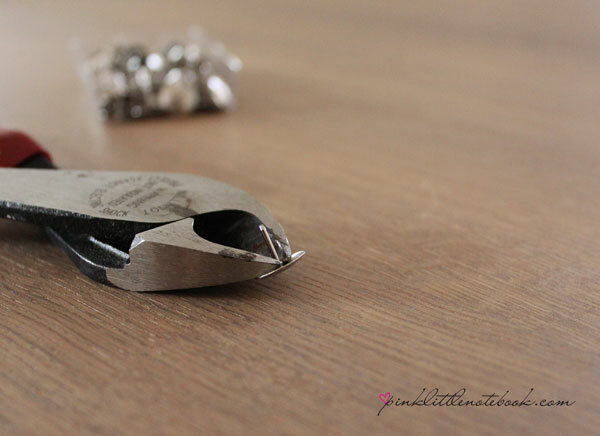 Use your glue and begin by placing one of your corners on first. Make sure you hold in place for a minute or two to ensure it dries in proper position. Next glue on the molding. 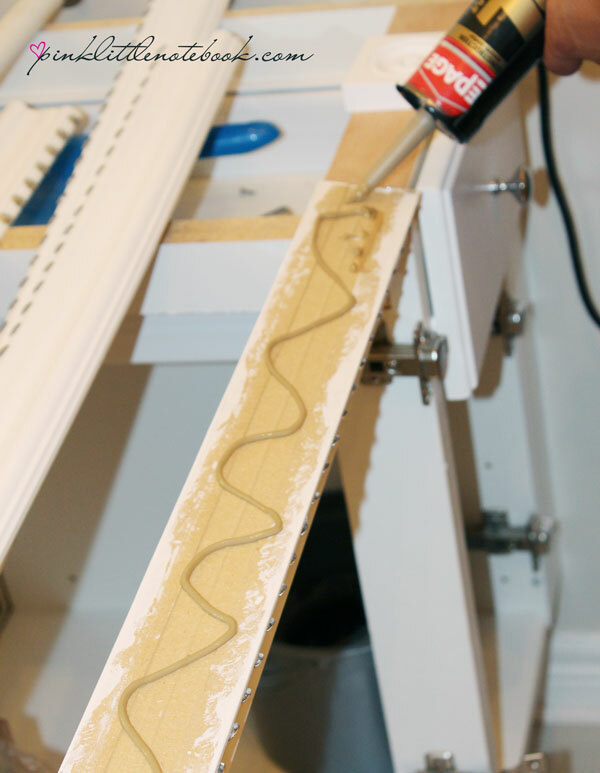 Once you have the sides and bottom piece of molding glued, let it completely dry before placing the top piece of molding. If not, you have a chance that this piece of molding may weigh down your other pieces which = big mess! Step 4: When your top piece of molding if finally in place and everything is glued, secure with painter’s tape. Let it dry for the reminder of the day! With four easy steps and $30.58 later, why not change all your builder’s grade mirrors to a fab statement piece! Have you given this a try? What’s your experience! Great job! I think the silver upholstery nails add to the overall “new Look” adding a bit of Piazz! I’m hoping to replace my 1977 fiberboard vanity by end of year or maybe in January. The builder’s mirror is sitting right on the top of existing vanity backsplash and I’m so afraid the workmen won’t be able to save it, but I’m going to try to get them to save it for me, so I can frame it. You’d think that the glue holding it in place, plus the plastic brackets would not have held this many years. Guess they made things better back then! Made to last! Hi Betty! I know what you mean. Our mirror was so hard to take off the wall, that we decided to just leave it there during the reno. 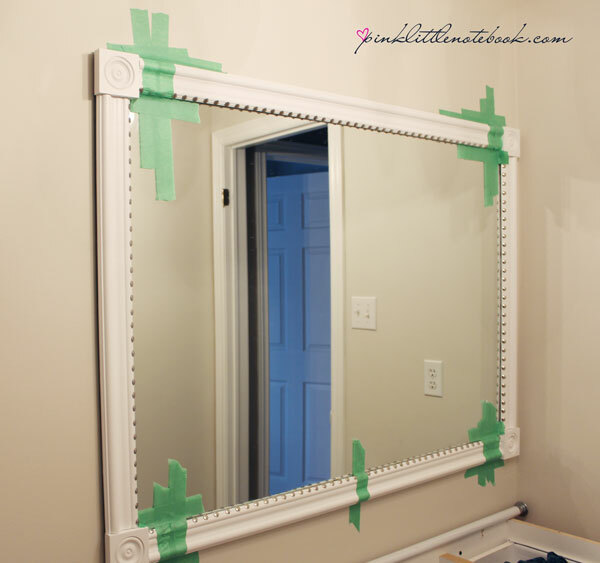 If you can save your builder’s mirror, do it! 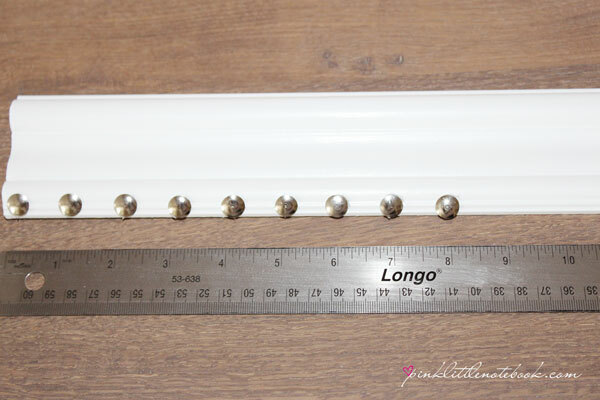 You won’t regret this DIY project! Thanks for the comment Meredith! I’m sure you will create a stunning mirror! I really like the addition of the corner blocks and the thumbtacks. Great idea! Your method avoids having to miter the picture framing. 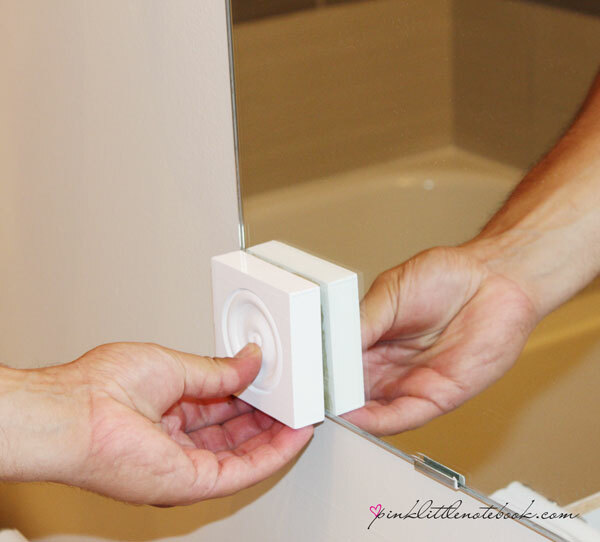 Will have to remember to do this when we replace our vanity that was put in when the house was built in 1977..cheap, cheap, cheap! 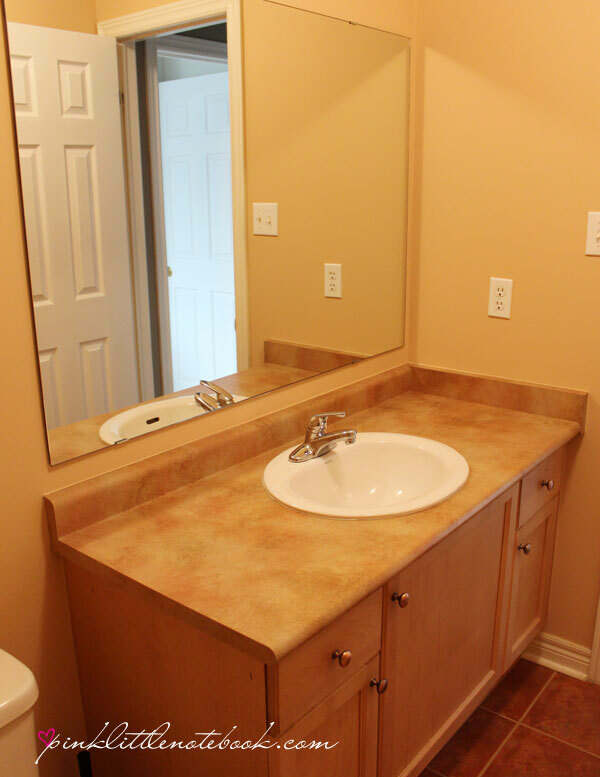 There are two bathrooms that need the vanities replaced but you know what, only the main bathroom that others use may get a new vanity. I figure I can paint out the master bathroom vanity since only us use that one. If it doesn’t look great after that, I guess I’ll have to replace it. When the previous seller put this house on the market in 2005, hired some fly-b-night painting contractor who didn’t bother removing the wallpaper glue off the walls, just painted over it. You can see where he tried to peel the wallpaper off and it probably wasn’t stripable type, so what a mess that left. Think it will all have to be sanded before even applying a new coat of paint and that is going to be a big job, that we’re hiring out. May end up applying a texture paint finish. And you know if we have to sand that bathroom, the dust will be all over the place. Will wait till spring when we can open up the windows in master bedroom when this project is tackled. Sabrina – you glued the molding over the little metal things holding the mirror in place? Im hesitant to do this. What if I (or the next owner of the house) wants to remove or replace that mirror? Its going to be stuck to the metal pieces which are mounted to the wall?? Any advise here? Hi Kelli, yes I glued right on top of the metal brackets. If you need to remove the mirror in the future, you would just have to remove the frame first and then you can take down the mirror. I would recommend using a scraper to stick inside the frame with a slight hit of the hammer to weaken the glue holding the frame to the mirror. Should come off with no problems. Hope this helps! Kelli are your metal brackets just screwed into the wall? Mine are. I just loosened them a tiny tiny bit on the top two and then made sure the glue skipped the space where the brackets would hide on all four. Now if I want I can slip a mini screwdriver under the bracket behind the mouldings and lift it up. This releases the top of the Mirror and then I lift it off the bottom two. Just make sure if you do this to not hold the mirror by just the frame. Just incase your glue did let go. 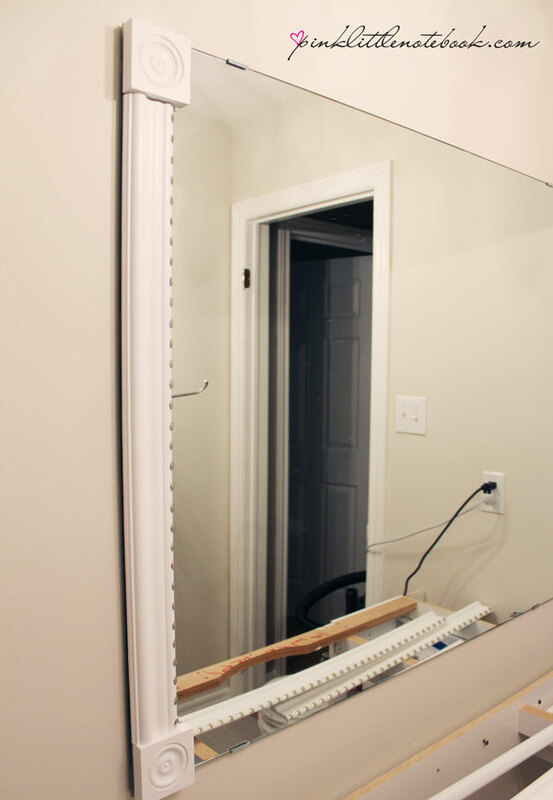 I’d like to know how to do this with the metal brackets holding up the mirror as well. It would seem that you’d have to cut out notched on the molding. Hi Kelley, you could notch the molding but I just glued right on top of the metal brackets. The frame is held by glue so you could easily remove the frame if you needed too in the future. However, removing a glued frame may leave traces of glue on the mirror and I’m not sure if your frame would be reusable after the fact. Oh thank you thank you! I have seen mirrors with the framing around it–but my lights are too close to mirror…adding it right to the mirror is a perfect solution! Do you think this would work if the mirror is held by one of those bottom rail things instead of just the clips? Ours runs the entire bottom of the mirror. I don’t know how that would work, because that piece of wood would stick out further than the rest of them, if gluing on top would even work. But it might look strange if I put the bottom board on top of the rail, because then I’d have vanity, strip of metal rail, and nicely framed mirror. Yes, I did my huge bathroom mirror that had the metal rail at the bottom I just glued it right over it and you cant tell at all. Love this idea! What type/brand of glue did you use? Thank you! I used PL permanent construction adhesive. 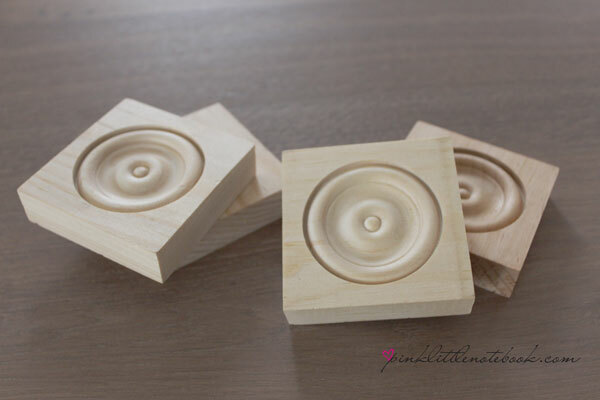 What are the 3 x 3 wood pieces called. I can’t seem to find them in Lowe’s. Hi! This is exactly what I was looking for! Been researching how to add a frame to those terrible looking old mirrors. Saw tons of beautiful work but I had to buy the wood and cut it at angles with tools I don’t have (miter saw). I am doing a quick revamp of a rental and I need simple! This is it! Thank you! I have one question: what did you cut the baseboard trim with? Hi Shaks, the easiest way to cut the baseboard is to ask the hardware store you bought it from. Just take your measurements in and they usually have no problem cutting it to size for you. You can also use a hand saw! Best of luck. My mirror has those raised, clear, plastic clips at the top. Any ideas how your framing techniwue may work with these? Sabrina, When I tried to add a molding to my mirror the glue was reflected in the mirror and looked terrible. How did you solve this as it is glued right to the mirror?? HI Nancy, I made sure not to put glue right at the interior edge of the molding. However, some glue did squeeze out to the interior edge where it met the mirror so I just chipped it away once it dried. Hi this really looks great. How did you account for the brackets that hold up the mirror? Does the molding fit flush over them? I have the plastic style on my mirror. So now, can you tell me about that awesome countertop? Is it DIY? I love it all! Yes it is! The countertop is just butcher block, which I sealed. Sabrina I have the plastic clips that stick out. How would I go over them? I am thinking that that mirror may have glue on the back which may hold it in place. If they look anything like mine, I just went right over them with the trim!